The rapid spread and adoption of production storage area networks (SANs) has fueled the need for multiprotocol routers. The routers provide improved scalability, security, and manageability by enabling devices in separate SAN fabrics to communicate without merging fabrics into a single, large SAN fabric. This capability enables clients to initially deploy separate SAN solutions at the departmental and data center levels. Then, clients can consolidate these separate solutions into large enterprise SAN solutions as their experience and requirements grow and change. Alternatively, multiprotocol routers can help to connect existing enterprise SANs for a variety of reasons. For instance, the introduction of Small Computer System Interface over IP (iSCSI) provides for the connection of low-end, low-cost hosts to enterprise SANs. The use of an Internet Protocol (IP) in the Fibre Channel (FC) environment provides for resource consolidation and disaster recovery planning over long distances. And the use of FC-FC routing services provides connectivity between two or more fabrics without having to merge them into a single SAN. 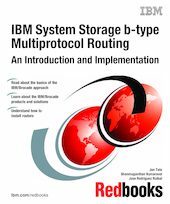 This IBM® Redbooks® publication targets storage network administrators, system designers, architects, and IT professionals who sell, design, or administer SANs. It introduces you to products, concepts, and technology in the IBM System Storage™ SAN Routing portfolio, which is based on Brocade products and technology. This book shows the features of these products and examples of how you can deploy and use them.